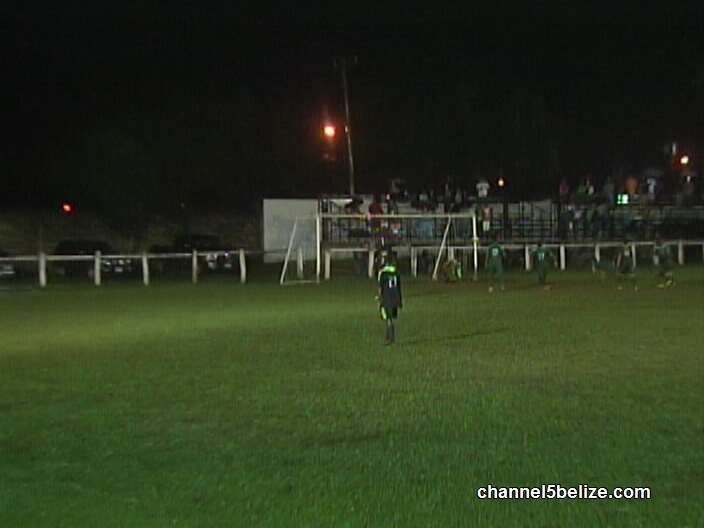 We kick off the action with Saturday night’s crunch time affair between Police United and the Belize Defence Force. The Police was looking to rebound and state its claim for leadership in the standings while the B.D.F. marched into the Isidoro Beaton Stadium looking to regain a measure of respect. However it’s the ambition of the Police that reaps rich reward when Andres Makin Jr. off the left wing picks out Clifton West whose diving header crashes against the crossbar, the loose ball reaches Armin August Jr. and his left foot punch pierces through the Military’s defence line including goalkeeper Tevin Gamboa 17 minutes in the long arm of the law establishes a 1 – zip lead. The Police remain the protagonist and Harison Kafu Roaches gets two bites at the apple but comes away unfulfilled. The pressure on the military increases when Roaches sets table for Devon Makin who is denied by a commendable left from goalkeeper Gamboa. In the meantime this left foot launch from point-blank range by Lennox Castillo leaves a lot to be desired. 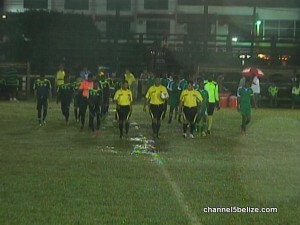 So we go to 2nd half and the Belize defence force looks to strike back. It’s Andrew Allen who comes up with a deft touch to deny the equalizer. The BDF then looks to get on to the scoreboard off this set piece on top the 18 and no doubt, the Police draw the lucky card when this curved specimen is pushed to the safety of the far upright by a magnificent action from Keith Allen. Again Allen displays good reflex action when he fumbles this left foot offering from Carlton Aromas and then dives into the muddy pitch to recover same. 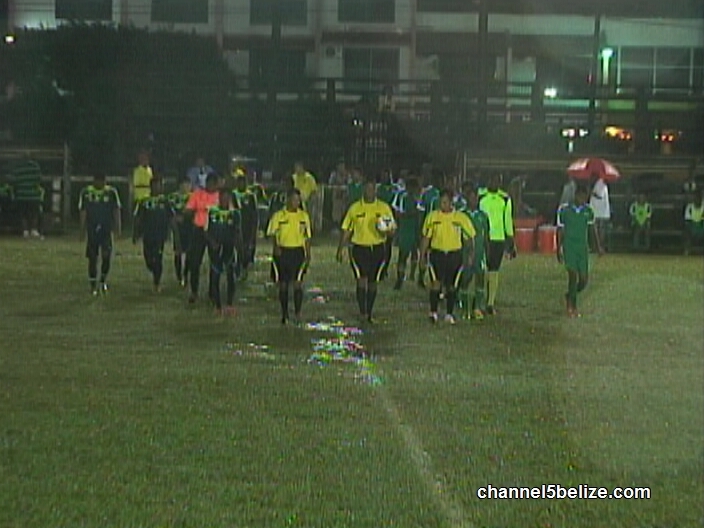 New you need good vision to penetrate this downpour but this defensive swat by goalkeeper Allen is direct to Shane Flores who makes him pay the maximum price and at the 83rd minute we have a 1 – 1 score. Keep your glasses on people because this right foot push by Clifton West off the left side finds the fore corner and the Police claim the 2 – 1 big w at the 85th minute. Not only that they know that they’re so much closer to the Championship series with 9 pints from 4 outings on a 5 match playoff. 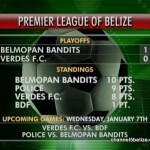 In yesterday’s matchup between Verdes FC and the Belmopan Bandits, the Capital City team hurt after they lost in a 1 – zip blast that propels team to the top of the standings after week 4 with a double digit 10 points. Verdes with 8 points now find itself in a must win situation going in the final fixture of the 5 match post season. The top 2 teams make it to the 2nd game championship series. Thus stay tuned to Wednesdays schedule when game two gets off at 7:30 PM. Verdes FC and the B.D.F. 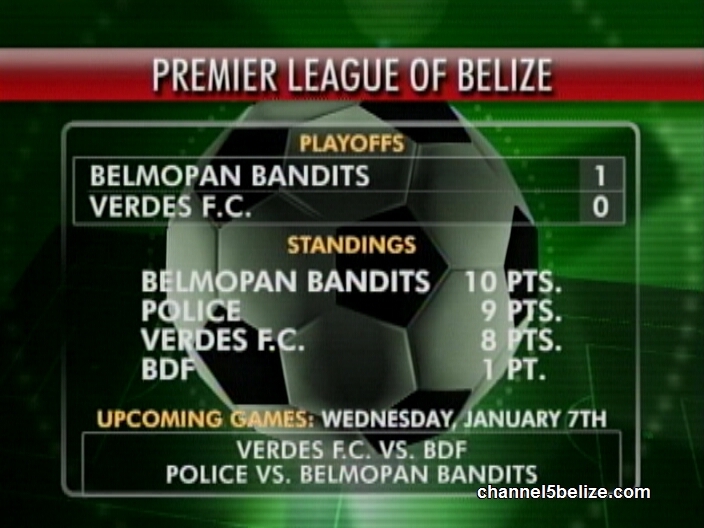 at the Peoples Stadium and the Police will battle the Belmopan Bandits at the Isidoro Beaton Stadium. The only thing certain going in is that B.D.F. with only 1 point to show will not make it to the title round. Turning to the cycling scene, the Mexican rider Hector Hugo Rangel rode in uncontested to take the 2014 Krem New Year Day Cycle Classic. 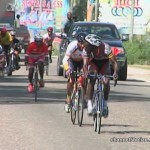 You will recall he finished 5th in the 20th Annual Cross Country Cycle Classic. Darius Santos the American riding for Bel Cal took 2nd place, the gallant effort by Ron Vasquez of Western Spirit was forced into 3rd place, Angel Tzib riding for Smart took 4th while Giovanni Lovell of Team Digicell was impressive enough to round out the top 5. Alicia Thompson took the ladies category, Yan Cattouse the junior class, Hector Rangel was also awarded the Master win with John Delong and while Kenroy Smoke Gladden emerged victorious in the Masters 45 classification we say congratulations to all. 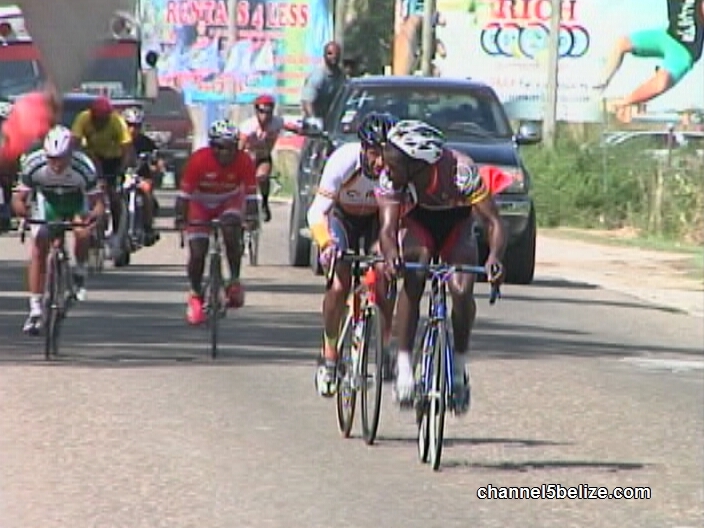 In other cycling news we focus on the Weekend Warriors 2014 Annual New Year Cycle race as it roars from Carmelita Orange Walk and its approach to the Haulover Bridge and it’s a 4 man breakage led by Shelton Graham, Ray Cattouse, George Abraham and Juan Manuel Cuellar. By the time the race reaches the finish line it’s a 4 man rumble. Ray Cattouse of C-Ray steps out of the pack to grab the A Class in 2 hours, 28 minutes, 48 seconds, the Mexican Juan Manuel Cuellar riding for C-Ray took 2nd, Shelton Graham of Bel Cal pulls up 3rd while George Abraham fades into 4th place. Dwight Lopez of Bel Cal rounds out the top 5. In the B Class the big man is Jim Scott of Santino’s who wins convincingly in a time of 2 hours, 27 minutes, 32 seconds. He beat out Isiah Willacy of Digicell 4G, while Clarence Tesecum of FT Williams rounds out the top 3. At the C Class level Enrique Morales of C-Ray finished the 40 mile ride in 2 hours, 22 minutes and 5 seconds beating out Valentine Sosa and Howard Humes of Digicell who finished 2nd and 3rd respectively. Is Mervin Underwood’s Early Morning Murder Related?